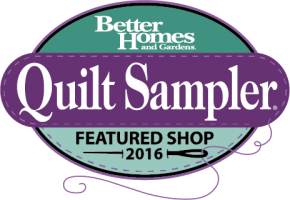 We are pleased to announce that M&E Quilt Shoppe has been chosen as one of the 10 featured shops across the United States for the Spring/Summer 2016 issue of Quilt Sampler® magazine, published by Better Homes and Gardens. Quilt Sampler magazine, which is published twice a year, has been profiling North America’s top quilt shops for the past 21 years. We had to submit a detailed application on the history of our shop, business promotions, charitable work, teaching schedules and our design philosophies. A panel of quilt experts led by Linda Augsburg, editorial content chief of American Patchwork & Quilting® magazine, narrowed down the applications to 10 featured shops for this issue. Imagine our surprise when we made the cut after only being in business for two years. We had to keep this big news a secret until this month and we are thrilled now that we can share it with you. 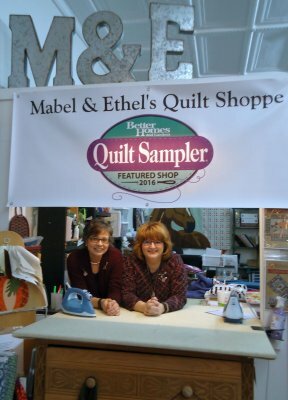 We have been invited along with the other featured shops to be officially unveiled at the spring International Quilt Market in Salt Lake City, Utah. assist us with this beautiful quilt. Designed by: Joanne Hubbard aka "Agnes"
Pieced by: JoEllen Schadek aka "Ho"
Quilted by: Lesa Guerrera aka "Emogeane"
The picture above is not the original quilt that was produced for the magazine, because they are going to display it at the quilt market in May. The quilt for the magazine was done in a king size, but we will be able to offer it in additional sizes as well. Made with the beautiful Embossed Cotton fabric line by Diamond Textiles, it is a fabric collection we both like. The magazine will feature it in the above spring colors, but we will also be offering it in the jewel tones as well. 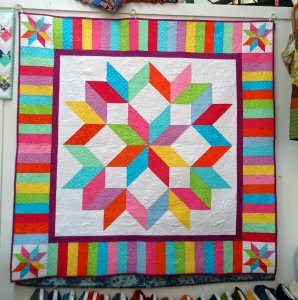 Quilt Sampler has proven to be a huge success, and we have been told that early, out‐of‐print issues are collector’s items. Chosen shops are inundated with visitors from all over the country. Quilters are known to try and visit all the shops in each issue, getting the signature of each shop owner in their copy of the magazine. So with that in mind we will have our pens ready! We will also be taking pre-orders for autographed copies to ensure that we get enough copies for everyone. We will be sharing more information about the quilt, kits and magazines that will be available in the coming month. We would just like to say thank you to all our wonderful customers for making this all possible, we couldn't have done it without you.